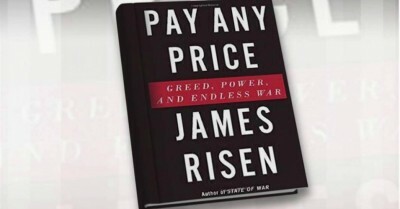 No single review or interview can do justice to “Pay Any Price” — the new book by James Risen that is the antithesis of what routinely passes for journalism about the “war on terror.” Instead of evasive tunnel vision, the book offers big-picture acuity: focusing on realities that are pervasive and vastly destructive. Published this week, “Pay Any Price” throws down an urgent gauntlet. We should pick it up. After 13 years of militarized zealotry and fear-mongering in the name of fighting terrorism, the book — subtitled “Greed, Power, and Endless War” — zeros in on immense horrors being perpetrated in the name of national security. As an investigative reporter for the New York Times, Risen has been battling dominant power structures for a long time. His new book is an instant landmark in the best of post-9/11 journalism. It’s also a wise response to repressive moves against him by the Bush and Obama administrations. A brief afterword in his new book summarizes Risen’s struggles with the Bush and Obama Justice Departments. He also provides a blunt account of his long-running conflicts with the Times hierarchy, which delayed some of his reporting for years — or spiked it outright — under intense White House pressure. Self-censorship and internalization of official worldviews continue to plague the Washington press corps. In sharp contrast, Risen’s stubborn independence enables “Pay Any Price” to combine rigorous reporting with rare candor. Now, James Risen is in the national spotlight at a time when the U.S. government is launching yet another spiral of carnage for perpetual war. As a profound book, “Pay Any Price” has arrived with enormous potential to serve as a catalyst for deeper understanding and stronger opposition to abhorrent policies.